What Are We Going To Do About Puck? Thursday evening I got home from work just before my wife and I helped her bring some of her stuff in the house. I had her bag with her laptop and other stuff as well as her lunch bag. I set the laptop bag on our bed and as I was walking out of our bedroom I noticed water on the floor. The water looked clear so I thought I spilled her Yeti cup but it was empty. Of course, it could have been empty because I spilled it. The water looked clear so I thought I spilled her Yeti cup but it was empty. Of course, it could have been empty because I spilled it. I wiped up the water and smelled it but didn’t smell anything so it remained a mystery. Early the next morning, around 3:30 or so, Rose got up to use the bathroom and let Puck in the bedroom on her return trip. Puck is fine in the bedroom, unlike Chris. He usually just sleeps at my feet. This particular morning he was a bit restless, moving from my feet to my head and eventually lying down somewhere in the middle, on top of my arm. Suddenly my had felt very hot and, in my half-awake state, I thought there was something wrong with Puck, like he was running a fever or something. Then it hit me and I was fully awake instantaneously. I announced very loudly, “Puck is peeing on the bed!’ and then got up so fast I scared him away. Now we had to get up and pull the sheets off the bed and wash them and put new sheets on. I also found more pee on our laminate floor. I wiped it up and this time I could smell it was pee. Friday I came home to more pee on the floor and I even found poop on the living room floor, though I don’t remember when I found that. Puck’s problem has always been pooping outside the box, which we have not been able to stop, except briefly, for a couple of years. I was always grateful that he didn’t pee on the floor and the poop was always on the tile floor next to the box (except when he pooped on the couch). Saturday morning I found pee on the floor in the living room. It was next to a table with a glass to that holds a large lamp. It was quite the pain to take it apart so I could clean the bottom of it. I left a message on the Vet’s answering machine Friday evening to ask for a Saturday appointment. I called them just before they opened that morning and she said I could have an 8 a.m. appointment if I could get there in seven minutes. We walked through their doors at 8:00 exactly. 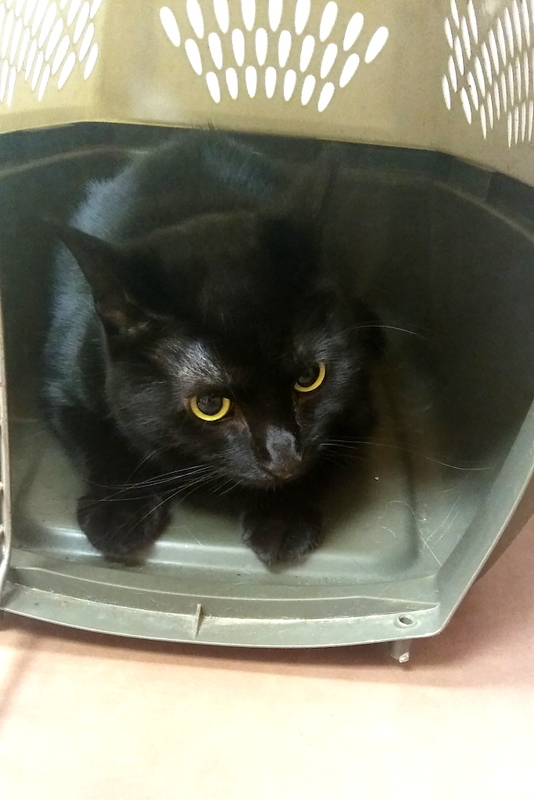 Puck was not happy to be there and wouldn’t come out of his carrier. The vet tech examined Puck in their secret back room lab and brought him back with the top off his carrier. I picked him up and let him lie on my lap for a while but he was nervous and go off my lap so he could hide behind me. 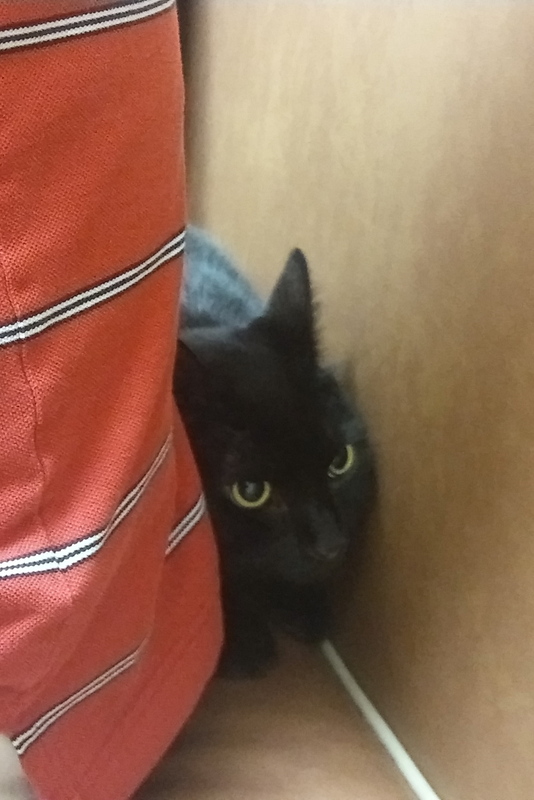 The vet said they found some bacteria and crystals in his urine and gave him – you guessed it – steroids and antibiotics. 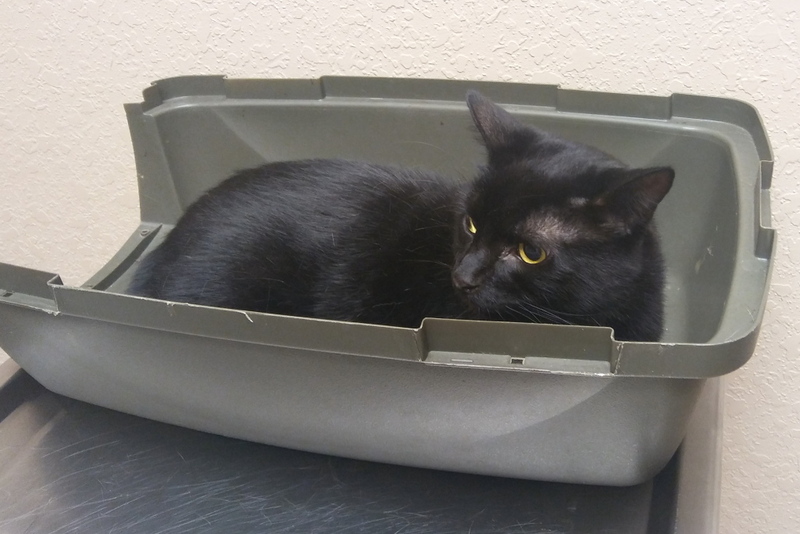 Some of you probably know that every time I bring a cat to the vet I make some kind of a joke about how I could be a vet if I only had steroids and antibiotics because all feline ailments are caused by a steroid and antibiotic deficiency. I joke about it but it is really kind of sad. We also got some Hills urinary canned for to try to help break up the crystals. Hopefully, that will help but nobody likes it much so perhaps not. I cleaned one of the litter boxes later that day and put in fresh litter and put it in a different location. My thought was that he may be associating pain while peeing with the litter boxes and new litter and a new location might help. I also bought a refill for our Feliway plug in and plugged that in between the patio and living room. It did help, at first. Puck peed in the box as soon as I poured the litter into it . . . then he peed on the floor two hours later. I had a half-bottle of Dr. Elsey’s Cat Attract that I bought for Pucks pooping problem. It didn’t work for that but I put it in the boxes with hopes it would work for pee. It didn’t. Now we are going to have to lock all our cats on the patio while we are at work. I hate to do that but if pee stays on our laminate floor all day it will ruin it. Also, maybe close proximity to the litter boxes will help. Update: This morning, shortly after this post published, I woke up to find pee on the floor in the living room. I then found something worse. Despite the obstacles we keep in his way, Puck pooped and peed on our sofa. We keep a cover on it for the poop but the pee soaks through. This entry was posted in Uncategorized and tagged blatter, cat, infection, pee on June 26, 2017 by Charles Huss. Gosh it sounds like a huge problem…..the only time we ever dealt with a peeing problem here was Sammy’s last few months….he wouldn’t use the litterbox for peeing just pooping (thank heavens). He had two spots he would use for peeing though – never furniture or rugs. I do hope that SOMETHING can help you out though because it’s an awful problem to deal with! Hope if there’s an infection or medical problem it can be cleared up without having to give the cats something you know doesn’t really “work” ! I would rather deal with pooping than peeing because it doesn’t soak in. Maybe it does a little but not like pee. Poor kitty! I hope you positive results soon for poor Puck! Hopefully, when the medicine has more time to work, it will solve the problem. Laminate floors are sensitive and not very pet friendly because of that. I graciously vomit on the rug to assist Mom with caring for the laminate in our new apartment…. You are so thoughtful Cupcake. You always get both. 😀 Thanks for the well wishes. Hmmm, that is a big problem, and Puck is sick, is it his body or mind, very difficult to say. We had once a cat who peed everywhere, and he had peritonitis, the vet said that there is no cure for that, more than ten years ago, that was the end. I hope the problem is solved soon, because it is difficult to you and the cat. Thanks. I hope so too. I don’t think my wife can deal with it. There is something seriously wrong with Pucky, and you might have to use steroids / antibiotics (sometimes they ARE called for). Brian at Brian’s Home talks about fighting the “pee wars” when he was younger, so maybe check in with his Dad for some help ! Praying something will start working for your boy ! Thanks. I will have read what he has to say. Thank you. The pooping I could deal with but now it is more difficult. I hope you can get this under control because I know how frustrating it can be. We actually have that stuff in our house. I didn’t know you can use it on cats. Thanks for the tip. oh no!!!!!! Poor you and poor Puck!!! I am so glad that The Island Cats Mom offered some sort of suggestion for help! Thanks. It seems like a good tip. Poor Puck. What a mess. We hope he feels better soon and the problem goes away. Get well soon Puck. If the medication doesn’t work soon something drastic might need to be tried. The only thing I can think of is to isolate Puck. It works for dogs. Never heard of it for cats. That is to kennel them. How you would do it for a cat, I’m not sure. Maybe a friend has a large kennel for his dog and you could borrow it for a few days. The steroids do cause them to pee more than usual. I’ve got cat books I’ll reread since my memory is shot. Maybe even Prozac would help after he’s well. Thanks. I’m willing to try anything but I wouldn’t like to avoid long-term medications. Thank you. He has been good for 24 hours so I am hopeful. argh – so frustrating. while it isn’t a long term solution, have you thought about cheap plastic shower curtains for the sofa? I bought pee pads after work yesterday. Poor Puck. He sounds like he’s a really sensitive and emotional kitty. If it’s not a medical issue, it could be stress related. (The crystals could be exacerbated by stress.) There are actually meds for that, if you are willing to look into them. He is a bit of a nervous cat, which doesn’t help. Thanks. I think Chris has matured, finally, but just a little. 🙂 I bought pee pads for now and put them in spots where he peed before. Poor Puck; poor you and wife. You’re solutions are all good it’s a shame nothing is working so far. Have you thought about taking him back to the vet for a follow-up? There could be lingering issues; although the pooping outside sounds behavioral. I also recommend (if you haven’t tried) a calming spray aroma therapy. Blackwing Farms has a wonderful selection made from essential oils. Jackson Galaxy also offers healing aroma therapy sprays. The only time I had an incident with a cat pooping outside the litter box was with a cat named Frankie who was clearly anxious when I had family over visiting and the visit became tense and arguing ensued. Frankie came out into the living room where the visit was going on and pooped in front of everyone then walked away as if to say–so there–enough already! I think he will end up back at the vet if we can’t solve his problem. I will look into aroma therapy but I know the feliway and calming collar are not working so I doubt that would work but you never know.